Robots were first built by humans to improve their lives. It has gotten to the point now that robots outnumber humans (or at least, voting humans) on presidential elections, and planets such as Chapek 9 are ruled by robots alone. While some robots are designated laborers and workers, others live regular human-like lives, and they are more and more integrated into society on Earth. In 3010, laws were even updated to allow robosexual marriage; marriage between a robot and a human. Some types of robots are also capable of evolving on their own (6ACV09). A robotic dinosaur eating Fry. Nannybot 1.0, a modern laborer robot designed to take care of children. Bender's First Born Son, an example of a child civilian robot. Robots can acquire wealth, marry, obtain jobs, consume resources, own property and live in robot societies. Each different facet of society in the year 3000 has some form of robot related - to human benefit or not. 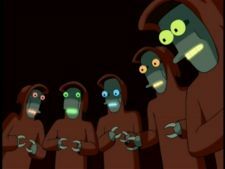 Robots in Futurama seem to exist in conflict with the idea of form and function - to which present day industrial design strives. In the year circa 3000 robots consume high volumes of resources (Calculon's luxury Bel-air home) and inhabit land (Robot Arms Apartments). In society they can be found in all levels of society - in the gutter "jacking on" (getting stoned on electricity) and at the top (Hedonism bot appears to be very wealthy, commissioning artistic endeavours on a whim). There is however little social mobility as a robot's function is predetermined by its type. Likely built by humans, these robots are bound to their programming. They can be easily identified by the fact that their name often reflects their job. They are not all "laborers", per se, but they were built for a specific job, which they perform without question. Possibly built by robots (evidenced by Bender's statement, "We can always build more killbots" (1ACV04)), these are free to do as they please, and in fact, many are homeless. They still seem to pay homage to Mom on Mother's Day, though. Their names tend to have little to do with their occupations. This said, it seems that 31st century robots aren't as bound to their programming as meant to. 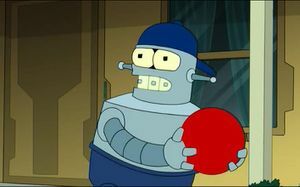 Bender is a prime example, made by humans and programmed to be a bending unit, but having a free will and being able to do as he will. He is a laborer robot per se, and has a constant, unconsious desire of bending (especially clear in "Bendless Love"), but can also choose not to, at least to some degree. The following is the history of robots originating from Earth. Project Satan was created around the year 2000. The oldest living robot is Calculon, who refreshes his look every now and then to avoid suspicion, and claim to be much younger. Created around the year 2000, he was originally a simple motorized arm working who helped create Project Satan. Project Satan himself, an evil Were-Car, was the first known robot to have a consciousness and mobility. The actual progress of robots is apparently as unknown as the first man on the Moon, but it is claimed that the original robots were similar to neanderthals, dressed in leopard hides and hitting scraps of metal with clubs. The Robot Devil has existed since before 2275, but then again it is not certain that he was created on Earth. The same goes for Kwanzaa-bot, who was assembled before 2354. The first Sport-Utility Robot with its inventor in 2927. 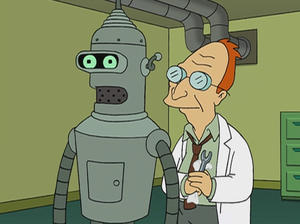 A new break-through in robotics was made in 2927, as Professor Farnsworth invented the first Sport-Utility Robot (SUR). 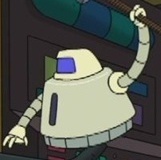 This robot was designed to be big and sporty (classified as a light truck), and is the ancestral prototype of most modern robots, including Bender. The SUR runs on alcohol and pollutes in a manner generally reminiscent of human burps, which caused Global warming, leading to all SURs being doomed to extinction by the president in 3003 at the so-called Big Robot Party. Although they were saved and global warming was stopped for the time being, these robots are now considered obsolete due to their effect on environment. Sometime in the 3rd millennium, John Quincy Adding Machine became the first robotic President of Earth after promising not to go on a killing spree. However, as with most politicians, he promised more than he could deliver. By the late 30th century, robots existed in similar numbers to humans on Earth, and the high number of robot voters caused Richard Nixon's head to win the presidential elections of year 3000 by exactly one vote. The Robot 1-X replaces the SUR in 3003. At Roboticon 3003, Robot 1-X was introduced by MomCorp. This new model is designed not to run on alcohol and exhaust pollution, but rather to run on pollution and exhaust fresh smelling oxygen. Extremely intelligent and obedient, as well as hovering instead of walking, it is mostly considered a laborer robot. After becoming a more and more accepted part of society throughout the times, some facets of robo-humanoid connections are still taboo in 3010. In July of this year, however, Amy and Bender among others fought to legalize robosexual marriages, through Proposition ∞, and succeeded. If Chris Travers is to be believed, Nixon's re-election in 3012 causes a chain reaction which results in a mass robot uprising in 3028, led by B.B. Rodríguez. At some point between the year 3050 and the year 10000, robots seem to have gotten terminated somehow during the many post-apocalyptic eras to come, and won't be created again till the year 10 million. Where as the robots from the 31st century lived more or less in peace with humans, the machines from the year 10 million are engaged in a violent, genocidal war against the remnants of mankind. Because many characters on the show are robots, only quotes that specifically reference robots should be included. Fry: Who cares what you're programmed for. If someone programmed you to jump off a bridge would you do it? Bender: I'll have to check my program ... yep. Leela: [from outside] Open up! Fry: C'mon, Bender! It's up to you to make your own decisions in life. That's what separates people and robots from animals ... and animal robots. Robot Villager: With all your modern science are you any closer to understanding the mystery of how a robot walks or talks? Prof. Farnsworth: Yes, you idiot. [He opens the robot's chest cabinet.] The circuit diagram is right here on the inside of your case. Robot Villager: [He slams the cabinet door.] I choose to believe what I was programmed to believe. Robots appear in all episodes, but the following are episodes of special interest. - Robots are first introduced. - We learn more of robot's social life, sleeping and more. - The episode is set on Chapek 9, a planet inhabited by robots. - We are introduced to Mom and MomCorp, which sells the oil that is necessary for robots. - We are introduced to Robotology and the Robot Devil. - The robot voters make Richard Nixon's head president. - We are introduced to Robot Santa Claus. - We learn more about Bending Units. - We learn more of Mom, the robots' mother, and they rebel. 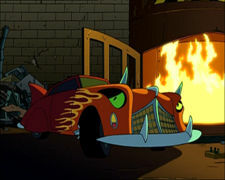 - The Planet Express crew tracks down Project Satan, the original were-car. - Another episode with Robot Santa Claus. - We find out that Bending Units are obsolete when compared to Robot 1-Xs. - We learn from Flexo that Bending Units are dangerously obsolete. - Robosexual marriages become legal. - We learn of robots' immortality. - Robot evolution is observed first-hand on the Robo-Planetoid. This page was last edited on 21 January 2016, at 21:04.